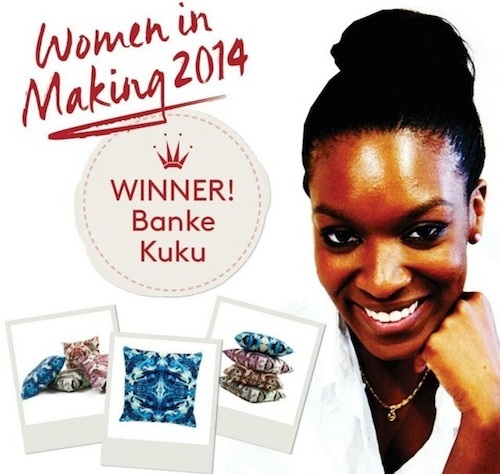 Women in Making 2014: Congratulations to Banke Kuku! A while ago I wrote about Triumph’s Women in Making competition*; the chance for independent businesswomen to win a £10,000 bursary as well as mentorship from the Women in Making mentors, who this year included fashion designer Roksanda Ilincic and shoe designer Sophia Webster. This is the second year that Triumph have run this competition and I would seriously urge you, if you are trying to start a business and need a bit of a kickstart, to keep a lookout for it next year. I’ll make sure that I post about it again, but seriously; it’s a great way to get your work seen and to receive brilliant advice from other women who have become successful in the industry. This year’s winner has been announced as Banke Kuku, an incredibly talented textile designer who makes use of bold, vibrant colours and statement prints. Banke went to Central St Martins and Chelsea College of Art & Design and her prints have been seen on the runway as well as in loads of the top interiors magazines. I’ve been having a little browse on her website and am in love with the printed ottomans! Banke has been kind enough to send me a scarf, which I actually feel is almost too beautiful to wear – I’m considering framing it. The print is so unusual – Banke fuses traditional African print with modern, Western design and the result is really very striking. It’s the perfect statement piece and I’ll be (very carefully) wearing it with long, floaty maxi-dresses throughout the summer. In the photo above I’m wearing it with my new Michael Kors silk shirt-dress, but more of that in Monday’s fashion post! You can find Banke’s website here and if you’d like to read more about the Women in Making competition you can find extra information here. Thought: Triumph should do a silk knickers range using Banke’s prints. I’d buy the whole lot! Knickers and perhaps some floaty, wispy camisoles or vests that you could wear underneath open shirts or loose t-shirts… Just a thought, just a thought. *This post is part of my work with Triumph on their Women in Making campaign. Previous Post I Won a Prize. And it’s Drinkable.